Because we have a beautiful bouncing, crawling, scooting, grabbing, teething, almost-walking 14-month-old for Christmas this year, we opted to skip the traditional Christmas tree and go for an alternative tree that we could place at least 4 feet off the ground for safety's sake. We had a few requirements: it had to 1) resemble a Christmas tree at least in shape and function, 2) fit on top of our strange corner fireplace, 3) fit all our favorite ornaments, and 4) break down easily and take up minimal storage space. We saw this Filigrantrae Danish Design Table-top Birch Tree and said, "Hey, we could make that...and, make it look much better!" 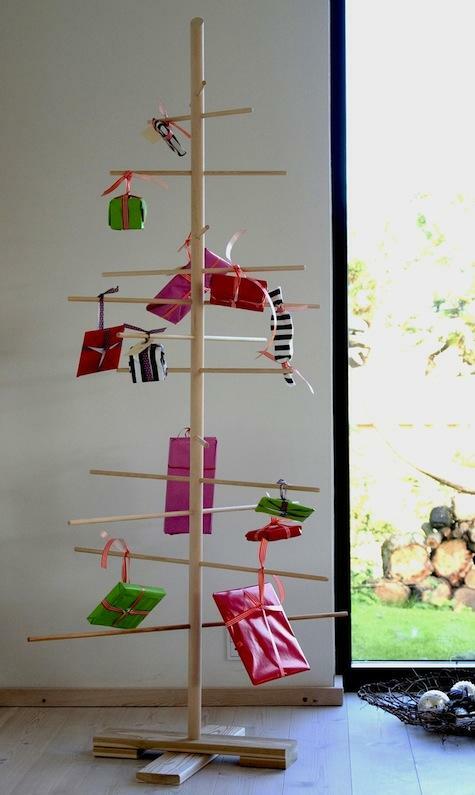 Oh, by the way the pictured tree costs a whopping $150 (marked down from $275) online at Design Public. As far as tools go, you will need a drill and a drill bit with a slightly larger circumference than your dowels. We also chose to spray the base brackets with some red paint and stain the trunk and limbs of our tree. 1) Determine where you want your branches to go in your trunk and mark the spots with a pencil - we chose to measure 6.5" up from the base of the baluster for our first branch, then placed the next branch 8.5" up (going in the opposite direction by 90 degrees - basically these two branches are perpendicular). The next two branches are at 14.5" from the base and then 16.5", again alternated. We followed this pattern all the way up...at 22.5" and 24.5", at 30.5" and 32.5", and one final top branch at 38.5" from the base. This gave us 9 branches with plenty of space for ornaments to hang unobstructed. 2) Drill through the baluster at the above measured points. Remember to alternate which side of the baluster you drill through, so the branches alternate. 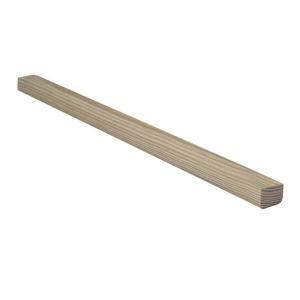 3) Now you're ready to cut the dowels for your branches. We trimmed the dowels so that we had the following lengths: 36", 33", 30", 27", 24", 21", 18", 15", and 12". We used a hand saw to do this - a table saw (or miter saw) would have been easier but we don't have one...yet. 4) At this point we stained our wood pieces and spray painted our base brackets. Remember, this is an optional step. 5) Now you are ready to install the shelf brackets for the tree base. After the first bracket was on, we placed the tree upright to attach the remaining brackets. We screwed the brackets into opposing sides of the baluster, using a level to make sure they were attached correctly for the tree to stand up straight. The top of the final bracket ended up being about 1/2 an inch lower than the other 3 brackets (see second pic below), but the tree stands straight and that's all that matters. 6) Because our dowels were a little loose sliding into the holes of the baluster, we placed some painter's tape around the middle of each dowel to make it more sturdy. 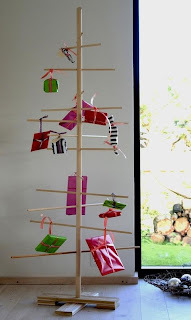 This is also good for helping you know where the center of each dowel is during assembly each year, so you have even branches on either side of the trunk. 7) Finally! It's time to insert the branches. Slide the dowels through the baluster holes, starting with the longest branch (36") in the bottom hole, and moving up to the top hole where the shortest branch (12") goes. After this step is complete, you're finished with assembly! Oh Christmas Tree...how wonderful you turned out! Now just add some ornaments and you're set to go. This project took us about 2 hours total and cost about $40 in materials. One of the most wonderful things about this decoration is that it can be easily disassembled and compactly put away after the holidays. Here is a picture of a more natural version - no paint or stain. Thank you so much. My grandmother was from Copenhagen and I wanted to do a Danish theme next year and I'm going to start with this Beautiful and simple tree:). Thank you again.